For 34 years, Col. Rokney oversaw the Mount Herzl Independence Day ceremony. Now he returns for a special presentation. For 34 years, Col. Rokney commanded the Mount Herzl Independence Day ceremony. Now, he returns to create the Magen David emblem and the number 70 with MDA's Lifesaving vehicles, in honor of Israel's 70th Independence Day. Rokney is famous for the special figures he created over the years with the soldiers participating in the ceremony, marking the transition from the National Memorial Day to the celebrations of Independence Day at Mount Herzl in Jerusalem. 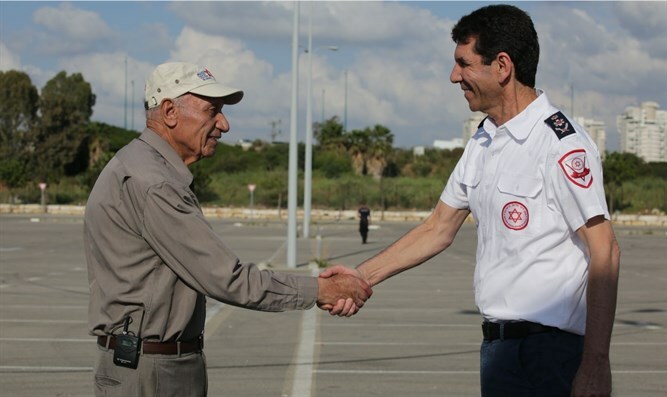 Two years after he retired from the IDF, Rokney commanded MDA volunteers and employees and handed over the baton to MDA Director general Eli Bin, effectively putting MDA teams on standby, ready for Israel's 70th Independence Day celebrations. A special video produced by Magen David Adom ahead of 70th Independence Day celebrations, Colonel Rokney can be seen orchestrating the maneuvers of MDA lifesaving vehicles into the Magen David emblem and the number "70." Magen David Adom was founded in 1930 and is an integral part of Israeli life and the history of the State of Israel. MDA is celebrating 88 years of saving lives, with 161 stations across the country from Metula to Eilat, 1050 ambulances and MICUs, 500 Medi-Cycles, 2,200 employees and a record number of 22,000 volunteers dedicated to saving lives. Director General Eli Bin: "On Israel's 70th Independence Day and into MDA's 88th year, we are facing the future, with professional and technological development, fulfilling our aspirations and overcoming new challenges. Magen David Adom, Israel's national rescue organization, wishes a Happy Independence Day to the people of Israel.